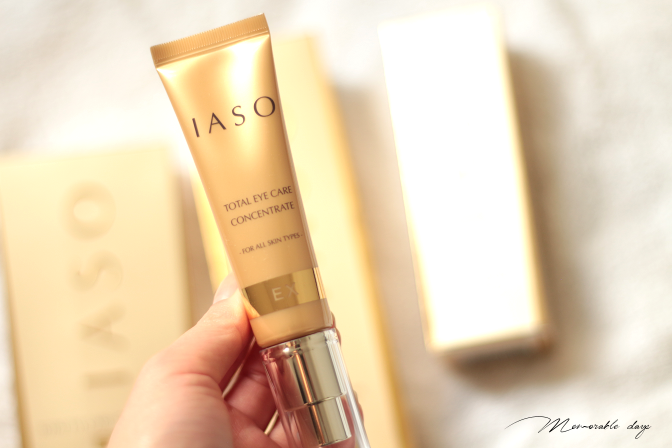 Review: IASO Cosmetics Conditioner, Booster & Eye Care | Memorable Days : Beauty Blog - Korean Beauty, European, American Product Reviews. Hi all! 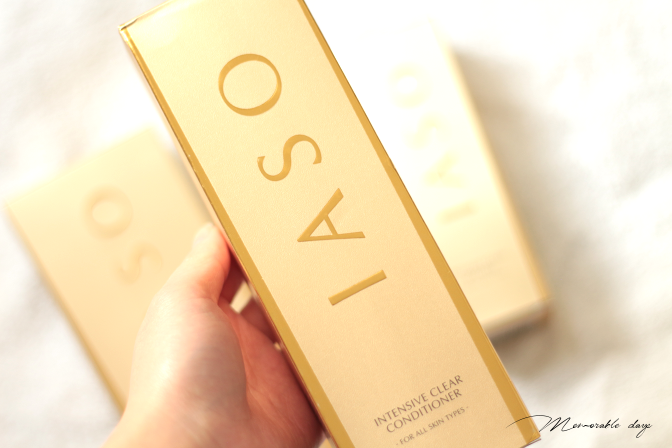 Today I'm putting a mid-end Korean brand in the spotlight that is called IASO. I hadn't heard about this brand before so I was excited to give their skincare products a try when they contacted me. 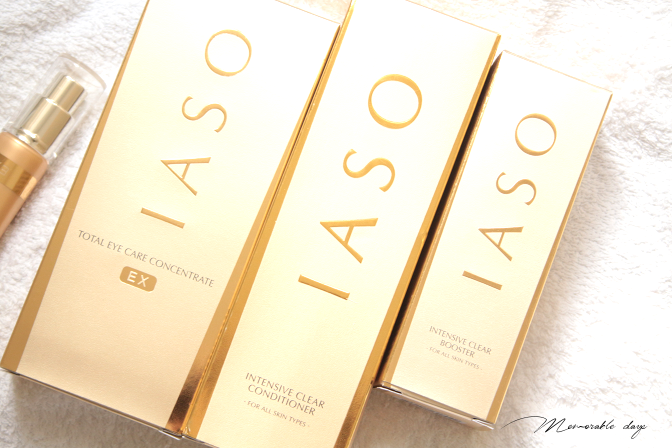 They have sent me the IASO Intensive Clear Conditioner, Intensive Clear Booster and the Total Eye care concentrate. 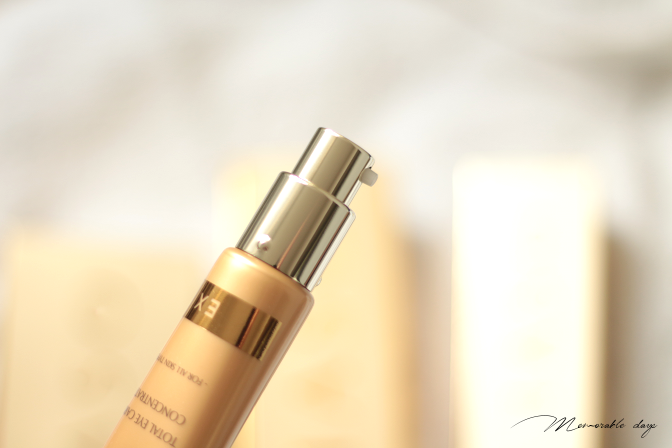 Continue with reading if you would like to know my thoughts about these products. First thing I noticed was their gorgeous chic packaging. It's all of a golden color, some only contains Korean descriptions and some contains English as well as Korean descriptions. This product claims to clarify and brighten your skin as it exfoliates dead skin cells with Salicylic acid and energizes the skin with Centella Asiatica and Nutrimarine. Far more than a conditioner, it prepares your skin to maximize the benefits of your other skin care products. This is suitable if your skin is dull, skin is rough or if your skin doesn't appear tight anymore. 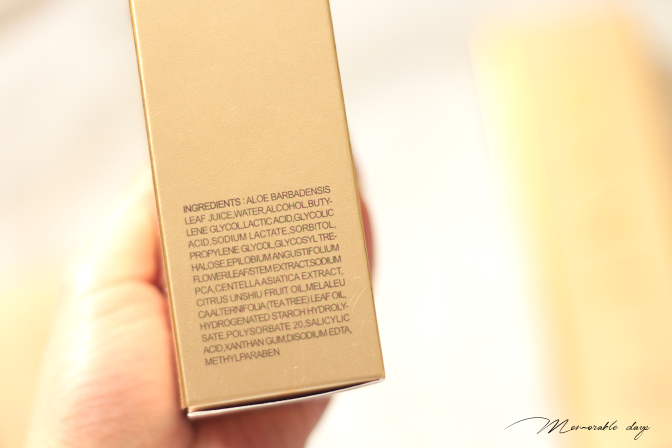 It contains 180ml of product and it's suitable for all skin types. Apply a bit of product onto a cotton pad and wipe around the face. Use this after cleansing. The product is white and is very liquid & runny. It feels moist on the skin and has a soft, non-sticky finish. It smells like a fresh cream which is pleasant, not overwhelming at all. Since it is very runny, product might come out if you leave the opening open, it comes out even though you didn't use the pump. Water, Alcohol, Glycerin, Diphenyl Dimethicone, Triethylhexanoin, Betaine, Polyglyceryl-10 Myristate, Ppg-6-decyltetradeceth-30, Phenoxyethanol, Methylparaben, Hamamelis Virginiana (witch hazel) Bark/Leaf/Twig Extract, Arctostaphylos Uva Ursi Leaf Extract, Mitracarpus Scaber Extract, Camellia Sinensis Leaf Extract, Centella Asiatica Extract, Morus Nigra Leaf Extract, Panax Ginseng Root Extract, Benzophenone-9, Fragrance, Dipotassium Glycyrrhizate, Aloe Barbadensis Leaf Juice, Hydrolyzed Lupine Protein, Sodium Hyaluronate, Blue 1, Ci 14700, Sea Water, Salicylic Acid (BHA). I have been using this product for a month now. It is a great product to use after you've washed your face with a cleanser. What I like about this product is that it feels very light on the skin. It feels moist, clean, doesn't leave a sticky feeling and clarifies the skin. Another thing that I love is that it makes my skin very soft and smooth after application thanks to ingredients like the aloe vera gel and licorice extracts that the product contains. I have been using this during day and night time. It dries fast so I can just continue with my skincare routine directly. It contains Salicylic Acid (BHA) which is an effective ingredient in terms of treating and healing acne, but I didn't notice anything about this, the product doesn't contain much of it neither. An intensive yet extra-gentle skin retexturizing formula with an exclusive complex of multi-hydroxy acids and plant extracts, which exfoliate dead skin cells and speed up the skin's own shedding cycle. (how awesome does that sound?) Instantly boosts your skin's smoothness, clarity and radiance and continuously reduces dullness, uneven texture and minor discolorations. Works precisely where and when needed. On dry skin, whisks away flakes. On oily skin, reduces surface oil. It also maximizes the benefits of your other skin care products. 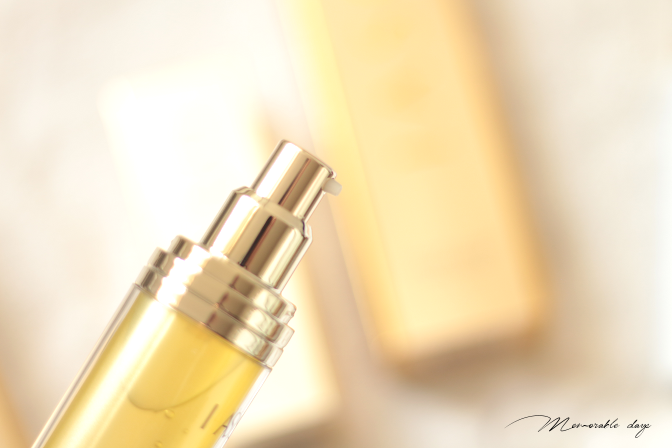 It contains 35ml of product and is suitable for all skin types. 4th week: skin is tighter and completely vitalized. 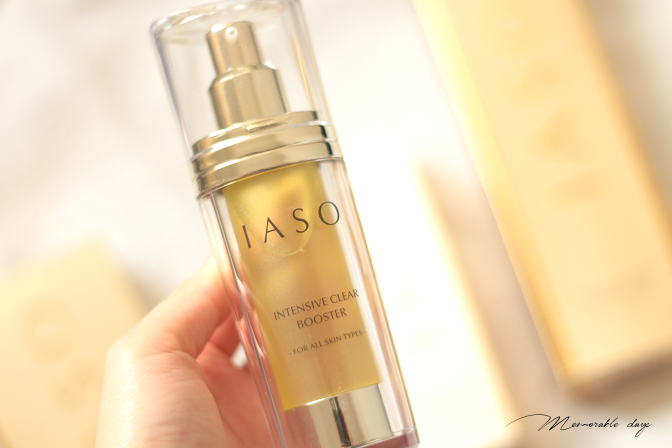 Apply to the face and neck after cleansing and toner, day and night. Avoid eye and mouth area. Follow with your serum and moisturizer. 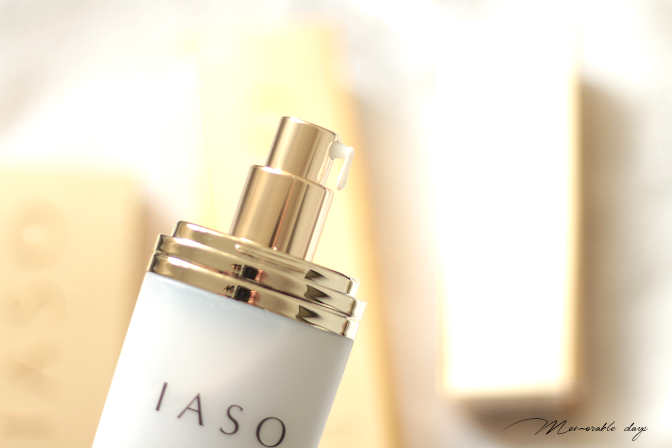 IASO recommends the use of a sunscreen as part of your daily skincare program in the morning. And they strongly discourage combining a hydroxy acid formula with a Retinol formula. It contains AHA/BHA which are strong ingredients (Glycolic Acid 3.7%, Lactic Acid 3.8%, Salicylic Acid 0.3%), but as you can see the percentages aren't that high. If you are new to AHA/BHA and want to give it a try, this might be a good product for you to see if it works for you. The product has a very liquid texture and is runny as well. It feels moist, lightweight, but a little bit sticky after application. It does brighten the skin up a little bit. It smells like rubber and alcohol, a mixture of that. It's not the most pleasant smell to be honest, but I got used to it. The product doesn't come out of the bottle even though this has a runny texture as well, unlike the conditioner. The product only comes out when you push on the pump. 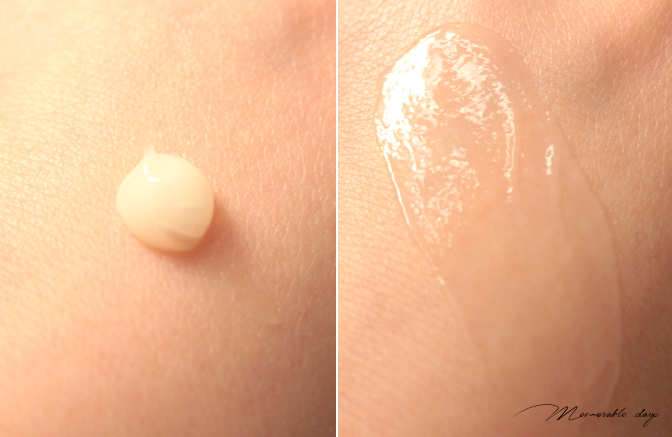 I have a combination dry skin and I did notice that it reduces surface oil a bit on my T-zone. I always get oily during the day (around 2pm), but now it's like only in the late afternoon (5pm). Despite it has AHA and BHA, I didn't feel any stinging or tingling feeling. It felt very mild surprisingly. My skin looks less dull after applying this every day. It brightens my skin up, while looking plump. I always combine this product with my other skincare products, otherwise it wouldn't feel moist enough. 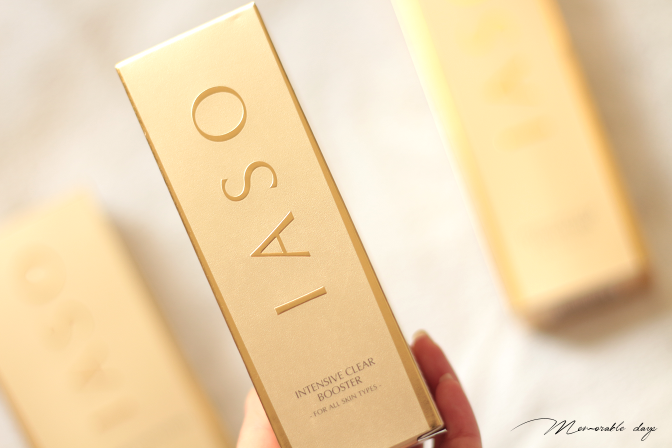 Above I mentioned about the improvement of the skin day by day, that IASO claimed. The results on my skin seems in between 2nd and 3rd week; radiance is visible and it feels clean, but not tighter yet. Maybe it just takes more time to see that. Overall, I'm very satisfied with this product. 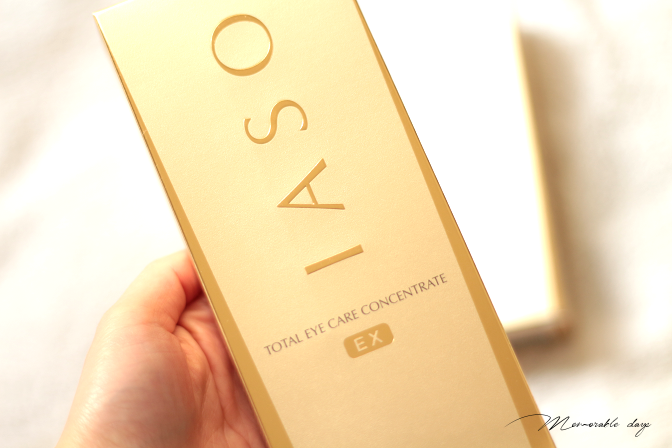 An advanced eye treatment that relieves puffiness, dark spots and fine lines due to stress, strain and fatigue. It also helps boost firmness and provides moisture to the delicate area. 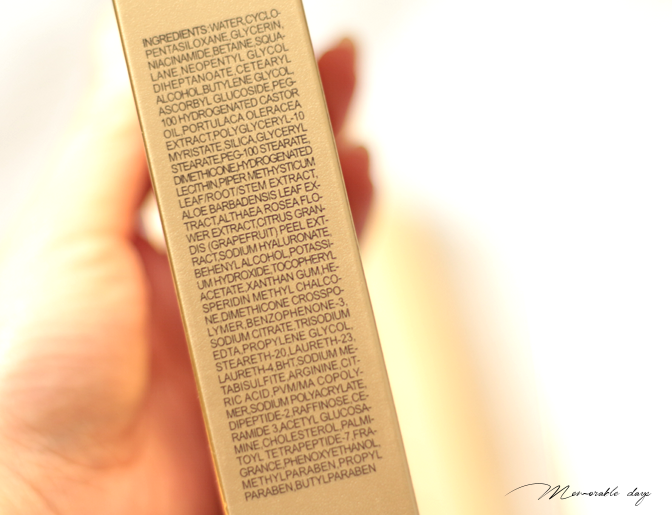 It contains 40ml (which is quite a lot) and it claims to be suitable for all skin types. With your ring finger, apply to entire eye area, using a gentle, patting motion. It has a gel texture and the amount that comes out can easily be managed with the pump. It has a fresh lemon scent. It smells like a perfume and might be a bit strong for some. I don't have puffy eyes, but I do have fine lines and dark spots. Unfortunately nothing visible changed after using this product for a month apart from that my eyes feel moist after application. 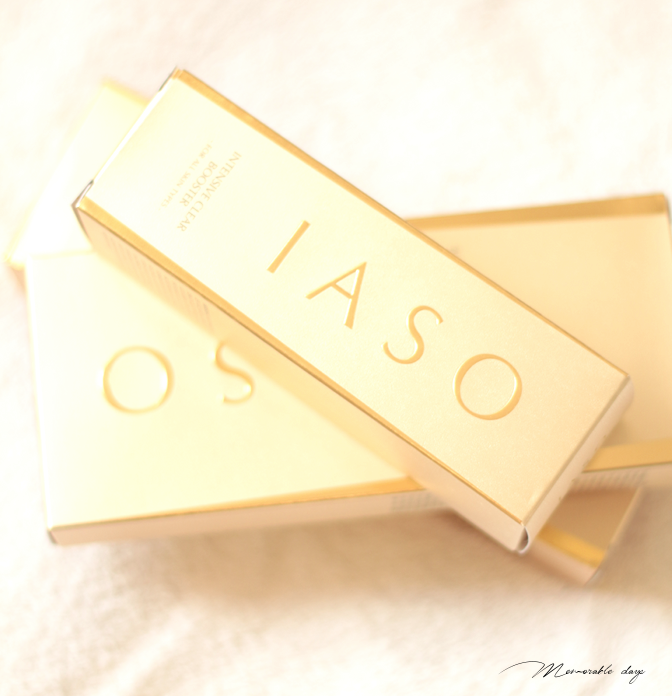 IASO is not only sold in South Korea but also in New Zealand, China, Vietnam, USA, Indonesia and Singapore, and also on their English website: www.go-iaso.com. The intensive clear conditioner is sold for USD$44.-, the intensive clear booster is sold for USD$65.- and the total eye care concentrate is sold for USD$69.-. Feel free to use coupon code: IASO4EVER to get 15% discount on any product purchased from that website. They do international shipping. After using these products for a month, I am pretty amazed by the outcome. 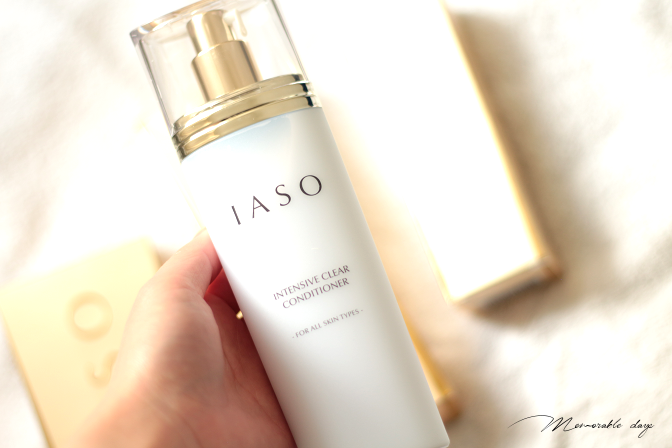 I am loving the IASO intensive clear conditioner the most, since it just feels so good on the skin, the soft surface that it creates on my skin is just perfect for after cleansing and for applying more skincare products. All of these products are claimed to be suitable for all skin types, but it is NOT suitable for (very) sensitive skin types. I used this while I had an allergy, while I had a very sensitive skin, but it started to sting badly. However, after my allergy was gone, my skin type changed into a combination dry skin type again (my usual skin type) and my skin is liking these products now. Make sure to always test it on certain spots like your neck and just wait for a day or so before applying the products on your full face. This, to avoid any break outs on the whole face. HAVE YOU HEARD OF THIS BRAND? WOULD YOU TRY IT?